The term “glazing” applies to either glass or acrylic. Typically, we use glass for anything under 32 x 40 inches, unless it is hanging in a child’s room or otherwise specified. A large frame will bend and bow, so an acrylic would be the only glazing option flexible enough to move with the frame! We offer only conservation glass, meaning that the different options all protect your artwork/objects from 99% of the sun’s harmful ultra violet rays. 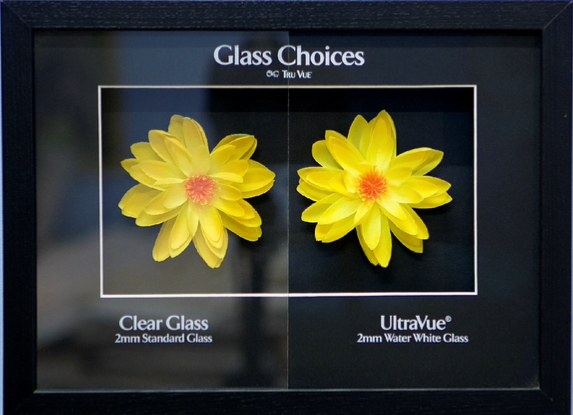 The standard options are Conservation Clear glass and Conservation Clear Acrylic. Conservation Clear Acrylic also has shatter resistance safeguards that protect against injury and damage to artwork. The best options are easily the Museum glass and Optium Museum Acrylic. When it comes to custom framing, they are unmatched with their amazing clarity and uncompromised protection. These products virtually eliminate reflections, block up to 99% of UV rays, have optimal light transmission to protect and brighten colors, enhance surface for better durability and easy cleaning, and have proprietary coatings that are engineered for permanence. The Optium Museum Acrylic also offers anti-static protection that immediately dissipates static, a durable hard coat that protects against scratches, shatter resistance that safeguards against injury and damage to artwork, and cleans like glass, so, no special cleaners are needed. Learn more about fillets and how they can add texture or color to your framing design.